BINNY'S!! SAVE 15% ON WINE, SPIRITS, BEER, AND CIGARS! Fancy some wine for a nice Friday night dinner? Maybe a six-pack of Chicago brewed craft beer? Or how about some fresh cigars for a big night. 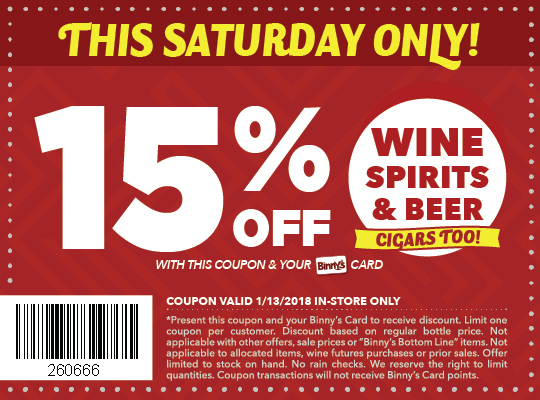 Binny's currently has 15% off on beer, wine, spirits, and cigars. The printer-friendly version of the coupon can be accessed by clicking here. Binny's Beverage Depot has officially opened at Six Corners. The store is very large, easy to navigate, and more importantly, it is completely stocked completely with a great variety of beer, wine, liquor and cigars. Great products are available for every budget. The Portage Square development at 4901 W. Irving Park Rd. received renovation permits last week to move forward with build out. The businesses projected to open include Retro Fitness, Binny's, Elly's Pancake House, and Culvers as well as a 300-seat theater. To read more, click here.